Insights on Epigenetics and Periconception environment from one of the leading scientists in the field! 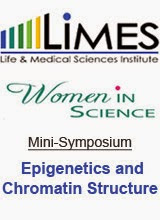 Our own contribution was presented in the talk entitled: "Impact of human sperm chromatin organization on sperm quality"
In other words, we have shown our recent results showing how important is the way the paternal genome is organized for the successful process of conception and moreover for the development of the new organism and the epigenetic information the baby inherits from the father! "Blame your dad for your epigenetics too"